Slightly rough-edged quality, but it’s still very good, recorded straight from the mixing desk. The Roses speed through their set with ease. Some fans who liked the Roses’s punky stuff from the early days cite this as their favourite gig, as the guitar is quite hard and the songs all seem to be played faster than usual. Ian Brown has a slightly different singing style too, which some people prefer and others don’t. It’s a good quality bootleg of the Roses in their home town before they were going to make it massive outside Manchester, and if you do like a punkier performance, then this will satisfy you. It is the best quality ‘Here It Comes’ you will hear. This was the Roses’ first big gig, was the at the start of their classic spring-89 tour of small venues around the country. 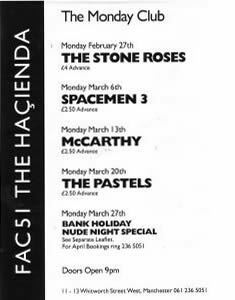 The Hacienda was at the time the biggest place you could play in Manchester, and was at the heart of the ‘Madchester’ movement, having played house music since 1987, and you could always find members of Madchester bands hanging around down there. 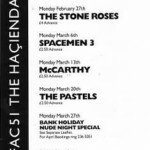 The reviewer in the NME of this gig said of it, “I’m already drafting a letter to my grandchildren telling them that I saw The Stone Roses at the Hacienda… comprising four unassuming boy wonders and a Happy Mondays roadie acting as ‘surf’ dancing accessory, and playing thoroughly brat-arsed guitar pop, have taken at least four years off my age. The Roses were very excited, and Mani was reportedly completely hyper, slapping hands with everybody. The performances of I Wanna Be Adored and Sugar Spun Sister are also captured on my TV Appearances video. I missed this gig, booo hooo. I saw it adverised for weeks in the windows of Piccadilly Records then located at Picadilly Bus Station. I ummed and agghed. I dont think it even sold out until the date itself. I was gutted when i saw the footage on Snub TV. I did make up for it though at Int2 and Lancaster Sugerhouse during that great spring of 1989.